Please accept my blessings. I am in due receipt of your letter of the 3rd instant and noted the contents carefully. The Mayavada Philosophy has played havoc in spiritual understanding leading to Atheistic tendency. The interpretation that one has to be naked before the Lord is also mayavada philosophy The pictures which Dan might have brought in the temple are certainly un-authorised In future before publishing any picture you must consult me. Any stage of life in Krishna consciousness may be a victim of strong material energy. Therefore we have always to take care and strictly follow the rules and regulations. You are a good boy and sincere devotee and I hope you will understand me right. I am glad that you are getting some nice job. They have tried for so many days and still the experiment is going on. Any way if by the Grace of Lord you can help the Society it will be a great help. You are taking a great responsibility in the matter of purchasing the house. It is very good to take all risks for Krishna but for our personal satisfaction we should not take the least risk. I am very glad to learn that Brahmananda, Yourself and all others have the transcendental courage to take all risks for Krishna and this act will enhance your glory in Krishna consciousness. 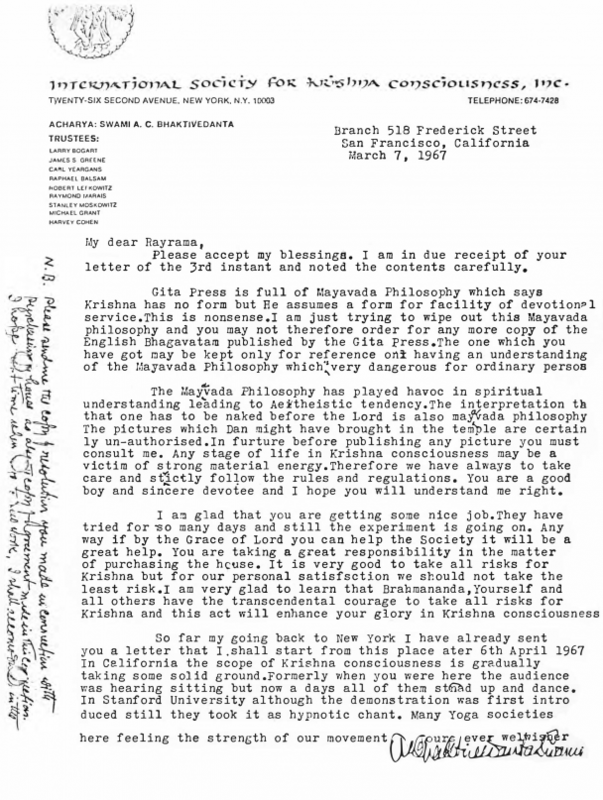 So far my going back to New York I have already sent you a letter that I shall start from this place ater 6th April 1967 In California the scope of Krishna consciousness is gradually taking some solid ground. Formerly when you were here the audience was hearing sitting but now a days all of them stand up and dance. In Stanford University although the demonstration was first introduced still they took it as hypnotic chant. Many Yoga societies here feeling the strength of our movement.